One of my best friends is Stephanie Johnson. 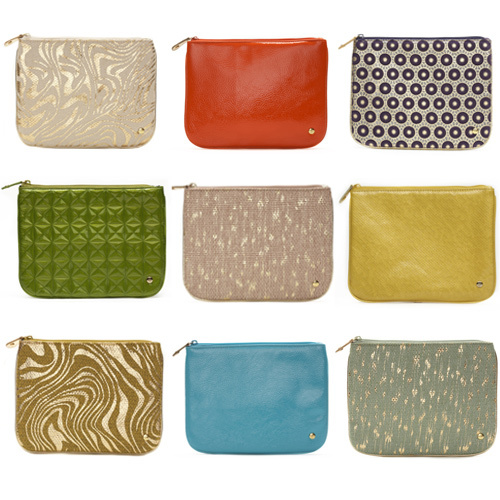 She designs amazingly stylish and immensely practical travel bags, from compact jewelry cases to plastic-lined makeup pouches to compartmentalized Dopp kits. She is hilarious and chic and generous--and adoringly Type A. We traveled to Capri, London and Madrid last summer. She packed seven days worth of outfits for various climates and swanky events into a single carry-on bag. I did not. And even though I brought an inordinate amount of evening clutches for the trip, I found myself poaching one of her gorgeous little makeup pouches to wear instead. Day and night. 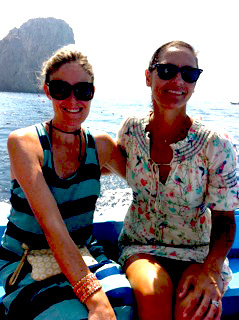 (See the pic below of Steph and I in a water taxi, off the coast of Capri. She's on the left, with an SJ bag in her lap, holding our Euros, cell phones, and whatnot). Over dinner the other night at my new favorite Santa Monica spot Milo and Olive, Stephanie showed me her spring collection look book, filled with glinty metallic clutches, raffia totes and patent pouches. As she succinctly said, "There's not a dog in the bunch." And I love how functional they all are, doubling as wear-everywhere bags. The ones above cost about $35. How brilliant is that? I will be toting them proudly. Marlien! A fashionista and a wordsmith to boot! Thank you for this beyondo gorge feature. My bags never looked better. Where to next friend? LOVE you. Beautiful bags and love the photo of you both in Capri. Thank you!